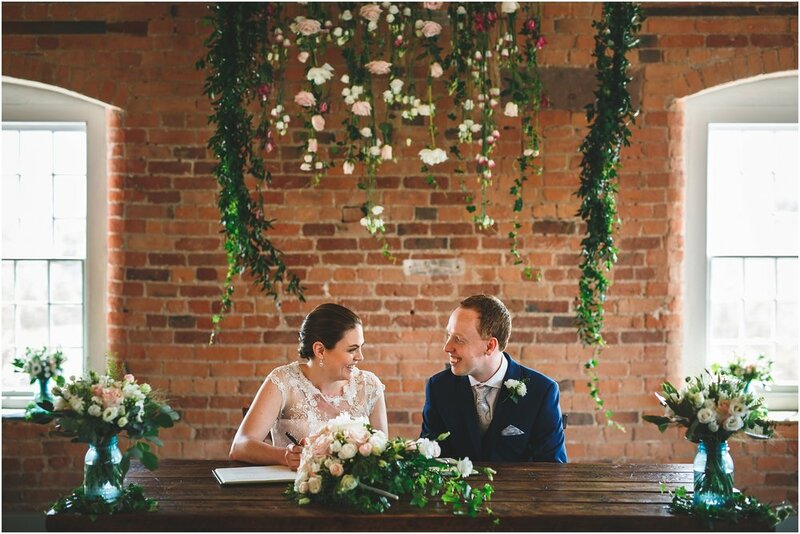 We were delighted to provide the wedding flowers at Osmaston Park marquee reception, near Ashbourne, Derbyshire for the summer wedding of Sarah and Tom. 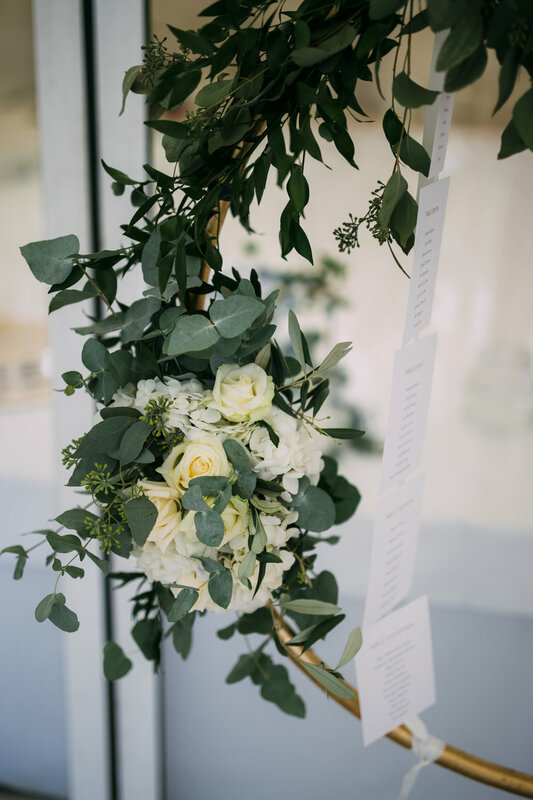 When we first met with Sarah and Tom, to discuss her Wedding flowers at Osmaston Park, we fell in love with her ideas straight away, Sarah was very interested in flowers and had a lot of knowledge which was fantastic, as she knew exactly what she wanted to create. 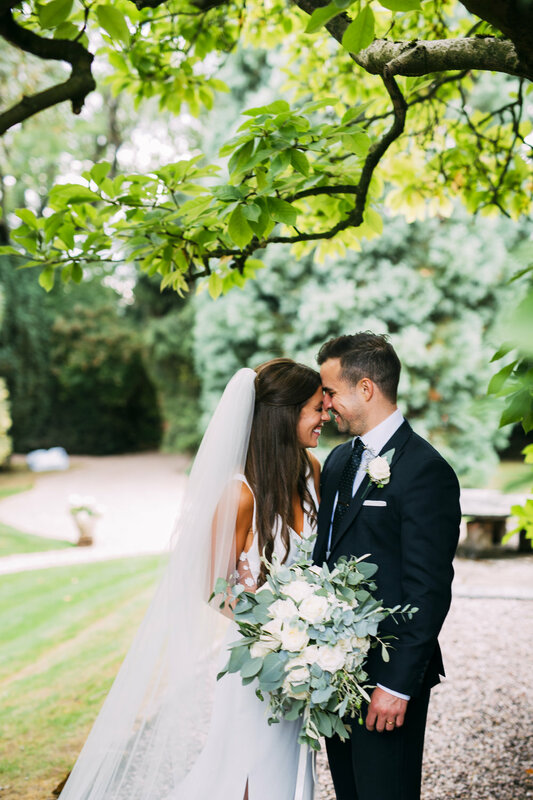 Sarah wanted her bouquet to look as though it had just been picked from the garden, and we think it suited her wedding dress, Grooms suit and wedding perfectly. We discussed the use of greens, creams and hints of smoky purple flowers. The flowers used included Thlaspi, “clea june” lilac Veronicas, white scented stocks, pale pink/white/pink Astrantia, poppy heads, alchemillia, cow parsley (ammi), rosemary, white love in mist (nigella), white and lilac scabious, cinerea eucalyptus,and herbs finished with twine and brides lace from her wedding dress. At the venue, we filled the brides various designed jugs with flowers to compliment the bridal flowers, we loved the use of branches to hold the tables numbers! We also filled milk churns for the entrance to the marquee, which works very well for this lovely, rural setting. Thank you to Matt at Matt Brown Photography, who's images we absolutely love here at Tineke!